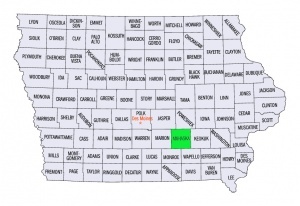 Mahaska County, Iowa, in the southeastern part of the state, was the location of a Mennonite (Mennonite Church) settlement which was established in 1852 some distance west of Oskaloosa, when the Peter Beutler family of Ashland Co., Ohio, located there. Beutler was a Mennonite preacher. Among the original settlers were three Beutler families and the Jacob Gehman family. Sometime after 1863 Peter T. Beutler was ordained to the ministry and Jacob K. Beutler served as deacon. After 1863 the Herald of Truth reported several visits to this community by Mennonite (MC) ministers from the east and occasionally communion services conducted in the small congregation. At no time was there a Mennonite meetinghouse in the county. Meetings must have been discontinued sometime before Jacob K. Beutier's death in 1892. Descendants of these families are no longer Mennonites. Now known as the Butlers, members of the family have been prominent in Oskaloosa, Iowa. Gingerich, Melvin. The Mennonites in Iowa: marking the one hundredth anniversary of the coming of the Mennonites to Iowa. Iowa City, IA: The State Historical Society of Iowa, 1939: 138-145. Gingerich, Melvin. "Mahaska County (Iowa, USA)." Global Anabaptist Mennonite Encyclopedia Online. 1957. Web. 26 Apr 2019. http://gameo.org/index.php?title=Mahaska_County_(Iowa,_USA)&oldid=92546. Gingerich, Melvin. (1957). Mahaska County (Iowa, USA). Global Anabaptist Mennonite Encyclopedia Online. Retrieved 26 April 2019, from http://gameo.org/index.php?title=Mahaska_County_(Iowa,_USA)&oldid=92546.